Cork Racecourse is located in Mallow Co. Cork. Facilities include the racecourse itself, but also an event / conference centre where events are held. The original beer cooling system was installed in the mid 1990s, making it over 20 years old. The system was still fully operational after over 20 years continuous service – a testament to the quality of the build of the Kilkenny Cooler. This is philosophy is one which we still very much embrace to this day. However progress has been made in beer cooler since then, particularly in the area of energy efficiency, so the decision was made to upgrade the beer cooling installation. Kilkenny Beer Coolers installed well 0ver 20 years ago. 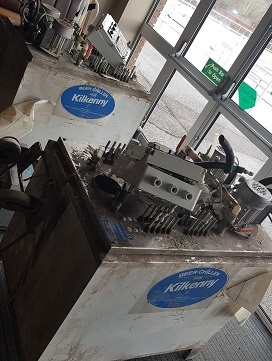 The Kilkenny VS beer cooling system was installed in April 2018 for the busy summer season. The energy saving VS cooler which is shown to have significant saving benefits over standard fixed speed and glycol installations of a similar size, while improving beer quality and reducing waste. The cooler design was nominated for a number of prestigious awards, most recently the Engineers Ireland Excellence SAward for Innovation. More information on that here. Kilkenny beer coolers are manufactured in our factory in Kilkenny and are installed by locally based trusted refrigeration contractors.